Planet Love Sound are playing their last Australian show at the Workers’ Club in Fitzroy on Sunday May 22nd. After that they will be heading back to Berlin for about six months, so if you miss this show, you won’t get to see them for awhile. I wish I could go wherever summer is, too! If you haven’t seen them before, or even heard one of their songs, just go anyway. They are also playing a show in Sydney tomorrow night at Oxford Arts Factory in Darlinghurst (it’s Friday the 13th so make sure you’re wearing your finest goth gear), and also a show in Brisbane on May 21 at X&Y Bar. I saw them again at the single launch for ‘On the Run’ last Friday night, excellent as always; so much energy! Tehachapi were supporting and they are great, another Melbourne band you need to go and see! 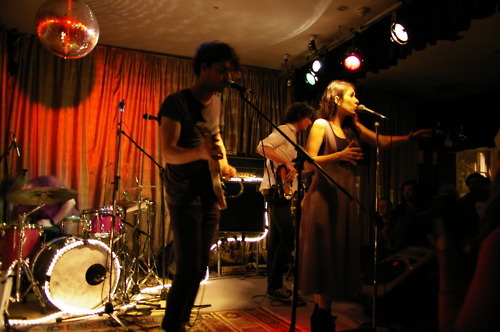 'On the Run' single launch at the Grace Darling Hotel.